WASHINGTON — The U.S. Senate is expected to take up a bill this week that would fund the federal government through the remainder of the current fiscal year, providing $18.53 billion for NASA including $3 billion for work on a heavy-lift rocket and crew capsule and a $350 million boost in space science spending over 2010 levels. The Senate measure differs from companion legislation passed in February in the House, which would cut U.S. domestic spending by $61 billion and provide $18.1 billion to NASA. U.S. President Barack Obama requested $19 billion for NASA in 2011. Although the Senate bill tracks closely with the authorization measure in key areas, it deviates in others. 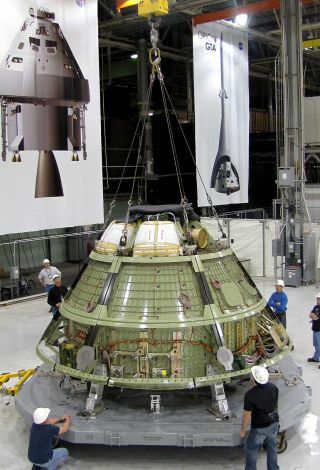 While the Senate language provides the authorized level of $1.2 billion for the "Orion Multi-Purpose Crew Vehicle," for example, it adds $170 million to the $1.63 billion Congress recommended last year to initiate development of a heavy-lift launcher capable of delivering at least 130 metric tons to orbit. Congress appropriated $3.74 billion for human exploration development activities in 2010, including Orion and the Ares I launcher, which has been marked for termination. In the president’s 2011 budget request, this account also includes development of commercial crew and cargo taxi services to the International Space Station as well as demonstrations of so-called game-changing exploration technologies. If the Senate version of H.R. 1 passes, NASA would have just $740 million for these other activities, though the president had hoped to spend $812 million just on commercial crew and cargo services this year. Like the House version of H.R. 1, the Senate measure frees NASA to terminate Ares I and other efforts related to plans by the previous administration to return astronauts to the moon around 2020. NASA currently is barred from doing so under the 2010 domestic spending bill. The Senate version of H.R. 1 also boosts spending for science programs by about $350 million over 2010 levels, to $4.81 billion. However, that funding falls short of the roughly $5 billion Obama requested and Congress authorized for the current year. Provides $5.74 billion to operate the International Space Station and fly out two remaining space shuttle missions this year, $200 million less than the $5.94 billion the House proposed spending in its version of H.R. 1 but roughly $200 million more than Obama requested for 2011. Funds Obama’s $3.1 billion request for NASA Cross Agency Support in 2011, a level that is $298 million more than provided in the House bill. Provides the $397 million Obama requested for the agency’s construction and environmental compliance projects this year, about $10 million less than the House version of H.R. 1 and some $50 million less than appropriated in 2010. Tracks with the House measure in providing no funding for space technology development under NASA’s Office of the Chief Technologist. The White House had requested $572 million for that activity in 2011.